Publisher: Ocean. Developer: Ocean; Data East. Released: 1990. Genre: 2D Run 'n' Gun. Other versions: AMI; AST; SPC; CPC; C64. It’s fair to say that movie tie-in games were not a regular occurrence in the late 80s, only starting to flood the market in the decade following. Not at least compared to today’s untold list of games based on films, many of which are very low quality, under-developed, and the blatant capitalism of a Hollywood money spinner. One game that did however make an impact on all platforms in 1988 was the gun ‘n’ run romp Robocop. 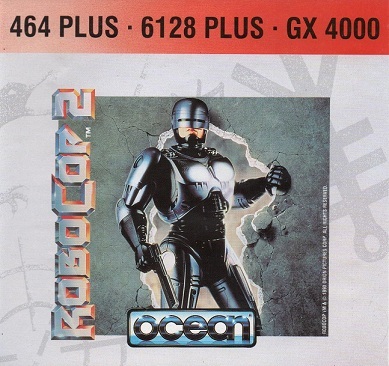 In 1990, alongside the release of the second movie, Robocop 2 made its cyborg shooting appearance on a host of home formats, and the GX4000 port was one of the more high quality versions released. This time, Alex Murphy had a lot more nimbleness and urgency about him, so this sequel became a hybrid mix of platform, shoot ‘em up and puzzler. So was the metal law enforcer showing a little rust this time around? Or did he still manage to uphold the laws of gaming? Call 911, it’s time to rid Old Detroit of the criminal scum of the future! Robocop was a popular game in the arcades. There was many a time I would walk in and hear “Drop it!” bellowing out from its cabinet, the unmistakable metallic voice of Robo himself. It made a good conversion to the home market too, the Amiga port being the most notable hit. While the first game was a basic shoot/run affair, the sequel turned Robo from a lumbering hulk into a sprightly gazelle! Gone were the multitude of baddies and firepower, and in with a plethora of platforms, puzzle solving and target range practice. 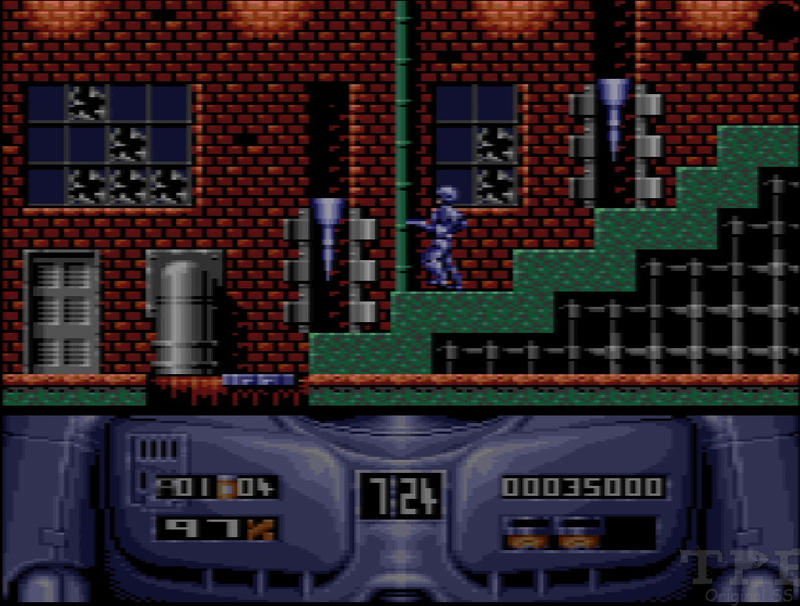 Robocop 2 also does away with the large sprites, opting for smaller figures with much more going on around, but the layout does vary on different machines. 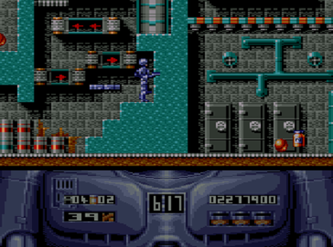 The GX4000 port of the game follows the movie’s most significant scenes; there are 3 primary levels of platform action, interspersed with puzzle and shoot-out games. You start at the Sludge plant, progress to the Brewery and finally to the OCP building for the final showdown with Robocop 2 himself. It’s quite faithful to the movie’s plot, but omits all the dialogue and secondary characters. 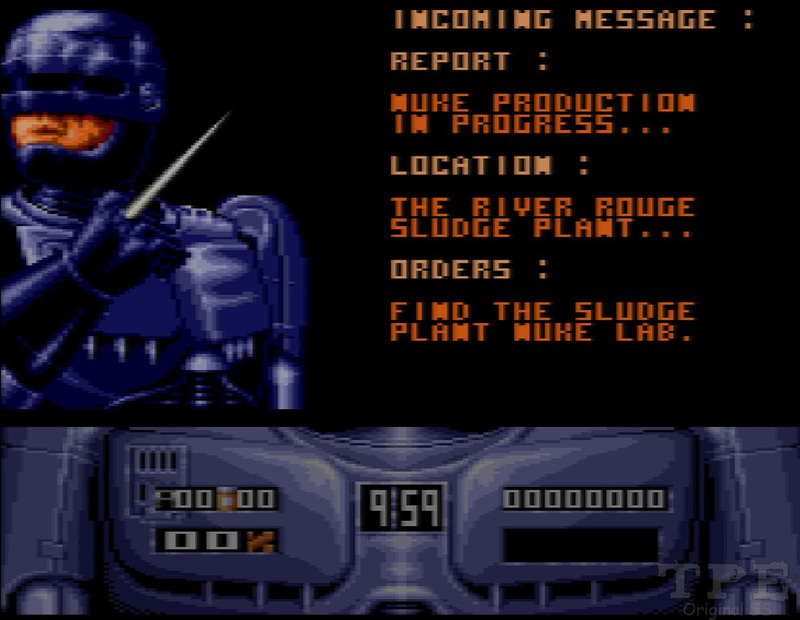 Nothing like a nice trip to the Sludge Plant Nuke Lab. Who's with me? Now, when the developers sat down to code the game for the GX4000, they actually choose to think about it and not simply port the CPC version over, and this was a very wise move. From the moment you switch on and are presented with the title screen, it’s clear that the console’s hardware is being used to its full potential, something of which is not common with the machines other titles. 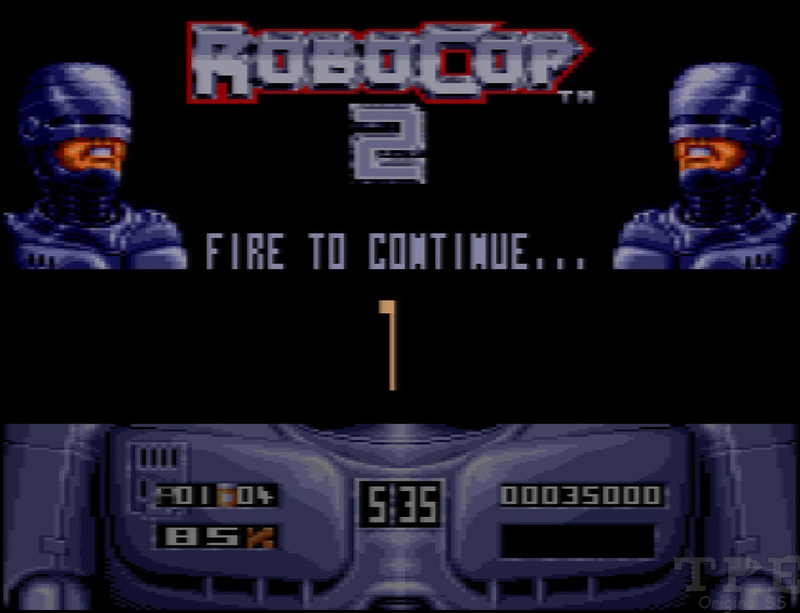 The animation on the title screen alone is glorious and colourful, with the Robocop typeface sliding in, gun shots hitting it for added effect. It even has an animated Orion Pictures logo just to show off. 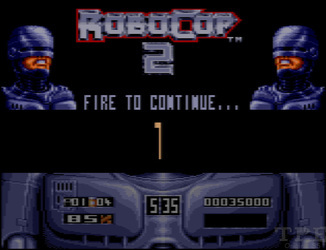 The music is also top notch, a brilliantly-themed ditty using all of the channels of the console, sounding far-removed from previous 8-bit music and fitting exactly with all previous Robocop scoring. This is all really a teaser however; once you get into the game, the visuals really start to impress. The first time I played this, I remember my jaw dropping at the intro screen. 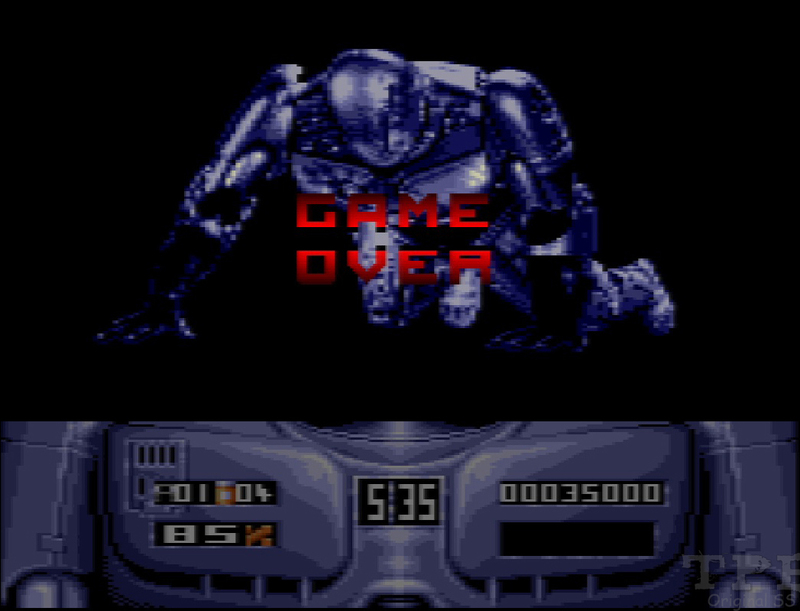 The sharpness of the Robocop image just blew me away and I thought that I was staring at the 16-bit version. It gets better too, as the in game designs are massively colourful, detailed, with so much going on, but not too much so to make things crowded. Apart from the main sprite, there are moving saws, electrical discharges, barrels rolling and spikes slamming down all over the place. All well drawn and smoothly animated. More impressively, it does all this without a hint of slowdown and remains at a constant pace throughout. This graphical excellence remains present with the other levels too, with maybe a few blocky background sprites in the shootout sub-level, but the puzzle stages are great and easy on the eye. The picture of Murphy forming in the corner as you progress is a wonderful touch. These sub-games are not the focus though, so any problems with these can be forgiven. What can’t been ignored so much is the problem with the audio. The music quality that accompanies all the stages is just as good as the title screen, just using different compositions. Unfortunately, you can’t have the BGM with the SFX, you can only choose to play the game with one or the other. The sound effects are very limited too; some good gun shot sounds but that’s about it. The timer counting down is just irritating, and to my disgust, no voice sample of Robo himself! I always play with the superb music on, but it would have been nice to have them both together. How much blacker could the title screen be? None. None more black. All the glitz means nothing without any substance to back it up of course and its good news here too. With the huge shift in game play from the original, it does take a bit of getting used too seeing your shiny rozzer jumping like he’s on Inspector Gadget’s springs and walking at a very rapid pace. This jumping action is a little suspect too, and doesn’t suit the heavy cyborg character. That aside, the depth of each stage is considerable, with lots to explore with many horizontal and vertical platforms, all with traps and power-ups in their bucket-loads. Bad guys crop up to blast away too, although nowhere near as frequently as the first game. There is a very likeable flow and balance to it all. It’s fast paced, has impeccable responsiveness and like all good platformers, it’s down to your timing and anticipation that wins the day. Collision detection is spot on, the scroll rate is excellent and generally it’s well refined and ordered, graphics combining with gameplay almost perfectly. All this makes for a rather exceptional little drug dealer-blasting, hostage-rescuing jaunt, and it’s not an easy game either. The platform stages are a challenge for any hardened gamer, the puzzle stages are infuriating but not impossible. Only the shootout part is a bit simple, but again this is offset by the bulk of the game’s contents. For me, only few things are missing to make this a flawless title. The SFX could have been much better and the jumping animation a bit more realistic, but all in all this is one of the few games that really does push the GX4000 to what it can do. Playing this makes me upset really, because if more games had been programmed to such a high level, maybe Amstrad’s machine could have had a happier life. Near 16-bit quality graphics and music, with quick and sharp gameplay, Robocop 2 is one of the finest movie tie-ins of the era. Robo-tastic stuff!